Pickled watermelon rind is an exceedingly thrifty item. Imagine food being so scarce that even a melon rind can’t be wasted. Imagine the South after the Civil War. Leave it to ingenious householders to make it delicious. An old Southern favorite, watermelon rind pickles are perfect for serving alongside a burger or added to chicken or shrimp salads, and are delicious accompaniments to pork chops. When selecting a watermelon, look for one that is symmetrical, heavy for its size, and does not have dents. Check the ground spot on the bottom too – if it’s creamy yellow, it is ripe and ready to eat. 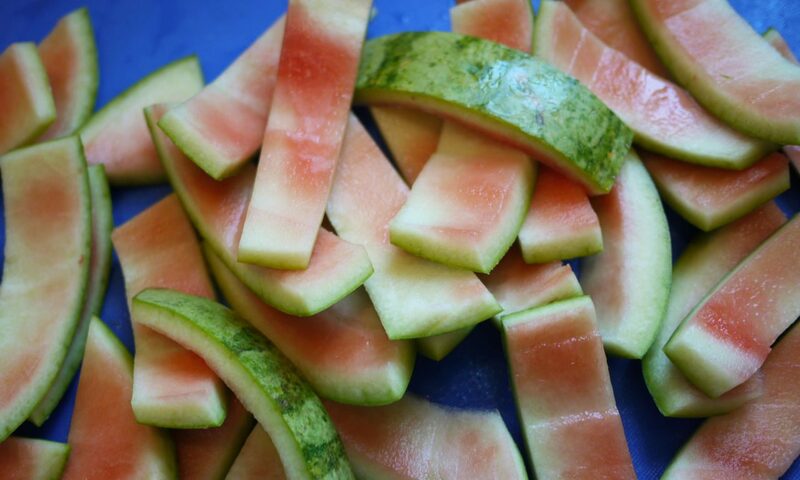 Break the watermelon down into slices. First cut the melon in half, and cut the resulting chunk into 1-inch slices. Using a sharp knife, slice the peel away from the flesh. (Save the flesh to eat.) Finally, use a vegetable peeler to remove the outermost dark green rind, and discard the peelings. Cut each piece of the pale green inner rind into 1 ½ inch pieces and place in a large mixing bowl. Make a brine of the salt and water, and pour over the rinds. Weight them with a plate, cover the bowl with a clean dish towel, and set aside overnight. The next day, drain the rinds and rinse with water. Combine the vinegar, sugar, and molasses in a large saucepan, and bring to a boil. Crush the spices in a mortar, and add them to the pan. When the vinegar syrup boils, add the rinds to the pan, cover, and cook gently for 10 minutes, turning them over regularly, until the rinds are translucent. Lift out the rinds with a slotted spoon, and pack them into four prepared pint jars, leaving a generous ½ inch headspace. Bring the syrup back to a boil and pour it over the rinds to cover, leaving ½ inch headspace. Wipe the rims, seal the jars, and process in a boiling water bath for 10 minutes. Wait a week or two before eating. Adapted from Kevin West’s Saving the Season. Learn more about what’s in season in summer. This entry was posted in Eat Good Food, Preserve the Season and tagged pickle, recipe, Southern food.